The Detroit riots of 1967 were the worst America had ever seen and made it clear to the nation that the city was at breaking point. Economic problems went hand in hand with the racial ones, and white flight to the suburbs began to accelerate. The downtown core especially showed signs of the economic strain. In order to try and counteract this, a group of businessmen came together in 1970 to form 'Detroit Renaissance', dedicated to stimulating an economic boom in Detroit. The following year, on Nov. 24, 1971, Henry Ford II, the head of Detroit Renaissance, announced plans to the City Mayor for a $500 million development that would include hotel, office and residential space on the riverfront. 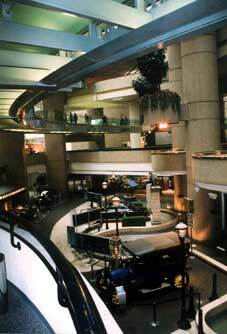 John Portman was named as the architect. Portman had pioneered the role of architect/developer role with the Peachtree Centre in Atlanta as well as the Embarcadero Center in San Francisco and had become famed for his buildings grand populist interior spaces. The development (which became know as the 'Renaissance Centre' after a public competition to find a name) would be the largest privately financed project in the world ($500 million equates to over $2 billion today). Phase one would consist of four 39-story office buildings and one 70-story hotel - for a time the worlds tallest - and phase two consisted of two further office towers. Construction started in late 1973 and over the next 3 and half years forty thousand tons of structural steel and two million square feet of glass would encase the five buildings. On Friday April 15, 1977, 1,000 spectators cheered as Henry Ford II and Detroit Mayor Coleman Young unveiled a plaque commemorating the private investors whose funds made the project possible. Ford said, "Detroit has reached the bottom and is on its way back up." In 1978, Mayor Coleman A. Young and the Downtown Development Authority invited a team of architects for their professional opinion of Renaissance Center. Their study was critical of many of the design features, especially the resulting isolation. The study was also critical of the city's poor riverfront planning and lack of planning in general. A later study was critical of the high retail vacancy rate in the Center. On the architect's web site today, The Renaissance Center is notably not among his list of "Achievements". Phase III, the residential development, was left by the wayside, as Detroit's population continued to leave the city throughout the 80's. In 1982, the City measured the population of the Central business district as 37% lower than in 1970. 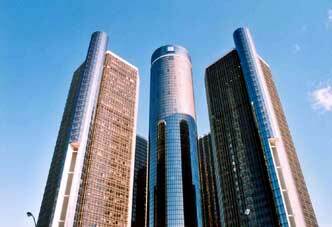 By 1983, the RenCen was in default in its mortgage payments for the second time, and the four insurance agencies that bankrolled the construction, along with Ford Motor Credit, assumed 53% ownership. 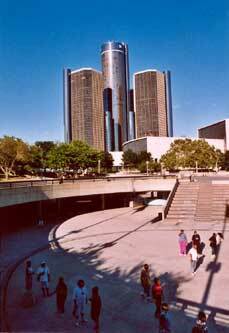 In 1987 the People Mover, many years in the building, began operation, with a stop at the Renaissance Center, that soared over the forbidding concrete berms. 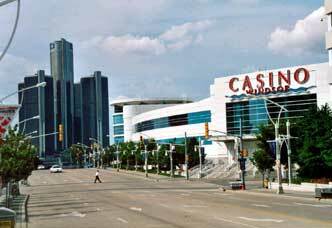 Finally, in May of 1996, General Motors announced that it was buying the Renaissance Center from then owner Highgate Hotels in Texas for $73 million, and would spend up to $500 million in renovation costs. "Arriving at the train station in Windsor, Canada, I immediately spot the Renaissance Center sparkling in the sun some distance away across the river. Somehow, despite being over a quarter century old, it still manages to look futuristic, it's sleek geometric forms rising forcefully skywards, although it is the futurism of the 1970s, a bleak and brutal Bladerunner image that imparts fear rather than optimism for what lies ahead. I catch the bus through the Detroit-Windsor tunnel and am welcomed to the city by a Neanderthal US immigration officer who interrogates me for 20 minutes about the various stamps in my passport ''Why d'you visit Vietnam, sir? That place is an evil shithole.'' ''What the hell were you doin' in Guatemala if you weren't smuggling drugs?''. This leaves me slightly at a loss for words and I mumble something about them actually being quite nice places, thank you. Then he asks me my reason for visiting Detroit, which seems a more rational question. Why would anyone visit a 'shithole' like Detroit, the most dangerous city in the USA? ''I'm here to look at the buildings'' I say. ''Ah'' he replies ''they're all empty. I wouldn't bother if I were you"
Finally he stamps my passport and I'm allowed to go. I realise now that the tourism industry simply doesn't exist in downtown Detroit. There is no tourist information centre, no museums, no art galleries, no 'tourist attractions' whatsoever in the downtown area. The only visitors from out of town go to the casinos or come for business conferences and don't dare walk the streets. The one attraction my guidebook lists is the observation deck at the top of the Renaissance Centre, so I decide head there to take a look and get my bearings. The RenCen sits isolated and bunker-like on the wrong side of Jefferson Avenue, away from the heart of the once-thriving financial district where it should have been built. 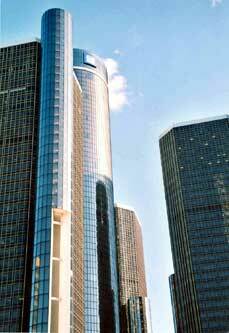 Totally self-contained, the RenCen isolates its thousands of daily workers in a social sense, too. People can drive from their suburban homes right into the RenCen's garages, stay inside all day, and drive home at night without ever stepping onto the streets of the city itself. I cross Jefferson Avenue to find that there is no pedestrian access at street level and so climb up two storeys to the sky bridge and enter there. Once inside I feel immediately removed form the outside world, the huge concrete atrium space offering no views of the city, with my vision instead filled with a labyrinth of circular walkways, escalators, curving balconies and staircases. Three stories below me I can see a display of old and new GM motor vehicles and up above the steel and glass walkway added as part of the $500m refurbishment program to ease circulation. I begin to look around for the elevators to the observation deck, and yet after half and hour of circuitous rambling I have found no sign. I ask a security guard, but he has no idea, and so I venture into the hotel and ask one of the receptionists. She explains that the observation deck closed three years ago due to lack of demand. So Detroit's final tourist attraction long ago bit the dust. 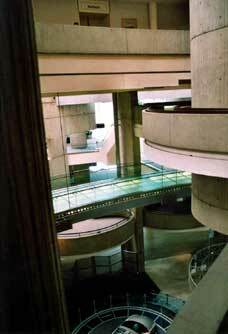 But maybe getting lost in John Portman's huge atrium is now Detroit safest and most entertaining recreational pastime."